Home Health & Wellness Tooth Talk What is Endodontic Treatment? Has your dentist ever told you that you need a root canal and you wondered what that meant? If so, you are not alone, many people have teeth that need or have had root canal treatments done before. “Endo” is the Greek word for “inside” and “odont” is Greek word for tooth; therefore, Endodontic treatment treats the inside of the tooth. A Root Canal is one type of endodontic treatment where the treatment is done inside the tooth and the root or roots. The outer layer of a tooth that you see when you smile and the portion that you brush that is whitish in color is called Enamel. The second layer underneath the enamel is called Dentin which is a hard layer and within it is a soft tissue known as Pulp. The pulp contains blood vessels and nerves that extend all the way down to the tip of the roots. 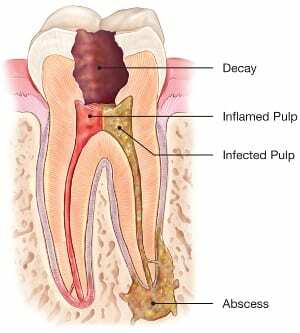 Root Canals are usually indicated when the pulp becomes inflamed or infected. The pulp can become inflamed from several causes such as: deep tooth decay, a cracked or chipped tooth, and or trauma to a tooth may cause pulp damage. When the pulp becomes inflamed and goes untreated for some time, it can cause pain and lead to an abscess. Some signs to look for include sensitivity when drinking hot and cold liquids, pain, swelling, discoloration of the tooth, and finally an abscess may be present in the mouth. Sometimes there may not be any notable warning signs, so go to your dentist and they can diagnosis whether the tooth needs a root canal and they may recommend you see an Endodontist for treatment. I hope this Tooth Talk has helped to explain what it means when you hear Endodontic Treatment. In the next Tooth Talk I will discuss the step by step procedure of a root canal. If you have any questions please call or email me at (615)445-8700, dr.jmitchell@integritydentalcares.com, Integrity Dental Care, PLLC.